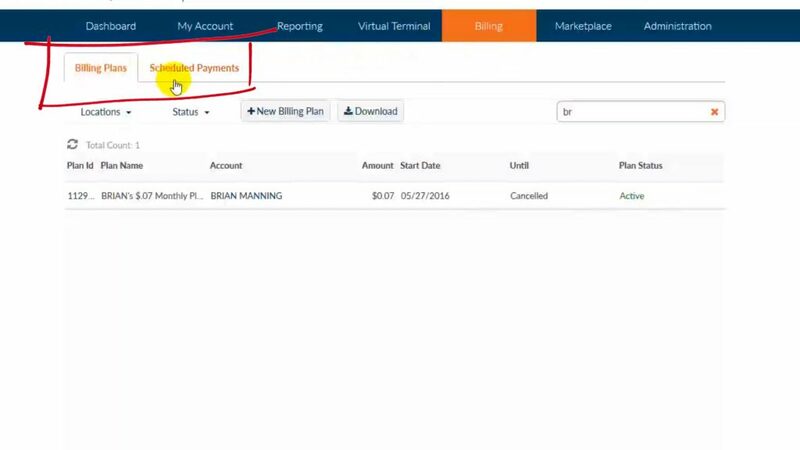 Hey everyone Brian Manning here with another Cardpointe tutorial video on How to create billing plans and recurring payments within the Cardpointe Virtual Terminal. 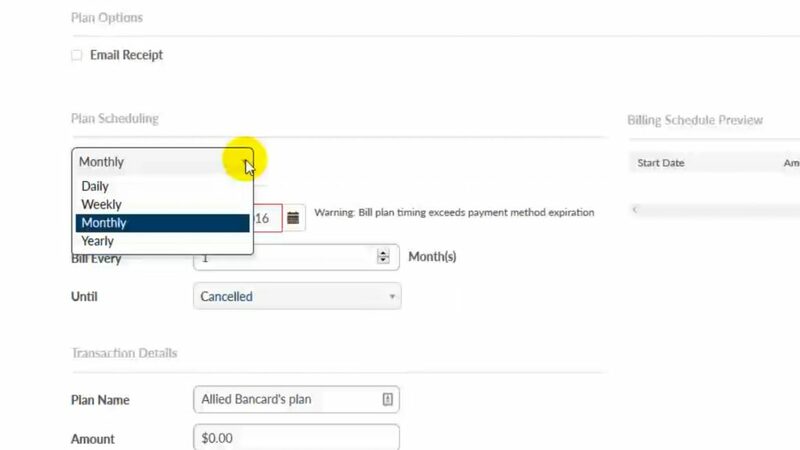 This function is gonna be particularly useful if your company allows payment plans or charges periodically for memberships or subscriptions for services and you would like to automate the payment process so you don’t have to worry about manually typing in credit card numbers each month. Furthermore, creating an actual billing plan this way, allows you to properly store and encrypt cardholder data within the Cardpointe system so you never have to worry about your customer’s data being compromised. 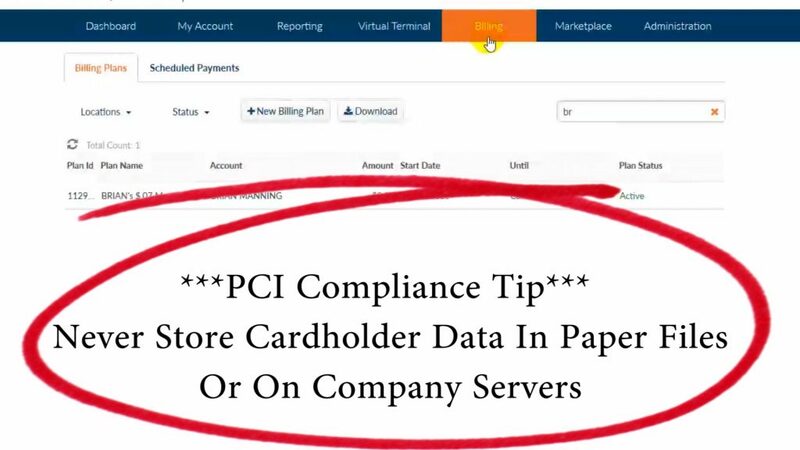 ***Remember, you never want to store cardholder data in paper files or on your own company servers. So if you have recurring payments you want to create billing plans. Once you’re logged into Cardpointe, just come over and click on the Billing tab from the main menu. To create a plan, just click the NEW BILLING PLAN button and this screen will load. Now, the top part of this page is going to look very similar to the virtual terminal because it’s the same information. If you’re creating a payment plan for a previous client or a current customer and they are stored in the customer vault already, you can simply search here and click to auto load the customer profile. If it’s a first time customer, creating a billing plan will automatically store the profile in the encrypted vault for future transactions. The first option you have is to choose whether to email a receipt every time the customer is charged. Just check the box for yes and uncheck for no. Let’s choose monthly for this example. 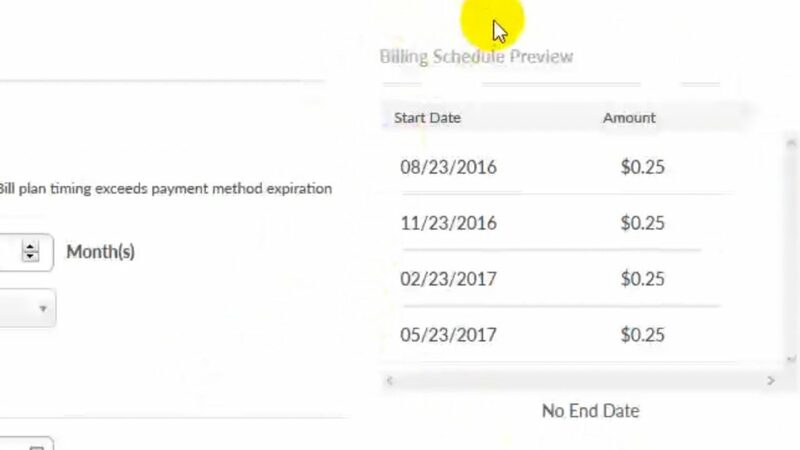 Next you can choose the date you wish to start the billing plan and in order to select a new date, you can either type it in, or click on this calendar icon and select from the quick calendar selection tool. Then you’ll choose the frequency of monthly billing. If you want the charge to be billed every single month, you’ll leave it as 1 but if for example you wanted to charge every other month you’ll change this to a 2. If you want to bill quarterly, you’ll choose 3… and so on. I’m going to skip down to the dollar amount and fill in the amount so that it will generate the BILLING SCHEDULE PREVIEW which you’ll notice over here. This shows you a forecast of the payment plan that you are setting up. If I change this payment frequency back to 1 you’ll see that it auto update the BILLING SCHEDULE PREVIEW again. ***One thing to note here is that if you elect to start you billing plan in a month with 31 days and you choose the 31st day as the billing day, the system will auto select to charge the last day of the month for every charge. However, if you start the plan on the 30th day in a month with only 30 days, the system will keep the billing date on the 30th with the exception in both cases of February, where it will charge on the 28th. It’s always best to just set the dollar amount and the frequency as you’d like it and check the Billing Schedule Preview to make sure it’s accurate. The field labeled UNTIL allows you to select options that determine the number of payments. By default it is set to “UNTIL CANCELLED” which of course means that these payments will just keep on going until you come in and cancel the plan which I’ll show you how to do at the end of this video. If I select a specific date, the plan will run as to the frequency you chose and will automatically stop the plan when that date arrives. If you select the number of payments of course the system will just follow number of payments and disregard the date range. So as you can see, with all of these options for payments, you can really customize the payment plan to your liking. When you set a payment plan, the individual transactions show up in the reporting tab and are added to normal batches. If a payment fails to charge within a set billing plan, they system will not attempt to recharge the card for that payment. So if you have a billing plan that is 5 payments for example, and payment number 3 fails, you you must manually re-authorize the charge. Under the SCHEDULED PAYMENTS tab, you can view all of your payment plans. You can search for a cardholder in the search box and all of the scheduled payments for that cardholder will auto populate. You may need to click on the calendar box and click on the clear button in order to clear any previously loaded date range searches. In order to cancel the plan, you just need to click on the plan ID to open the Billing Plan Details page and then simply click on CANCEL PLAN. If you want to edit the credit card on file for the customer and assign it to the current billing plan, you can click EDIT PAYMENT ACCOUNT and come over here to add the card. 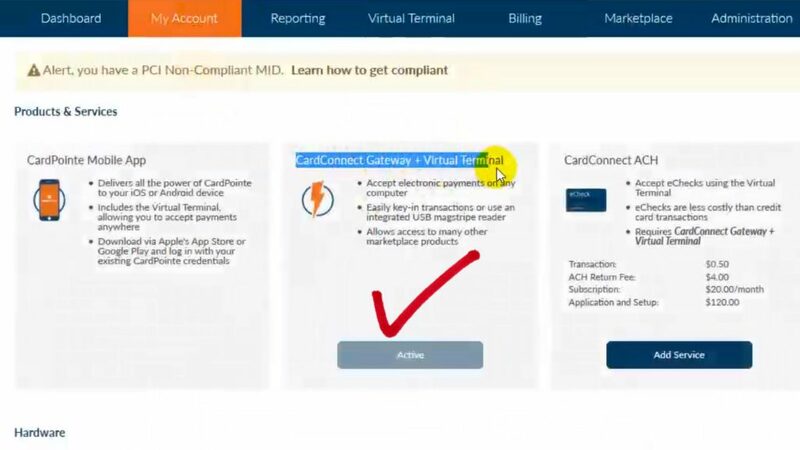 The billing feature comes with the Cardpointe virtual terminal access so all you need to do is activate the “CardConnect Gateway + Virtual Terminal” within the MY ACCOUNT tab inside of Cardpointe. So that’s how you create billing plans within Cardpointe. If you don’t have a Cardpointe merchant account, need to activate the virtual terminal or have any other general questions, click on the link in the description box to get in touch with me or another Cardpointe specialist. Please be sure to give this video a thumbs and be sure to subscribe to my channel so you’ll get future video notifications. Until next time, I’m Brian Manning and I’ll see you on the next one!